Kitchen elevation can also be called kitchen floor plan. As we both know that a great kitchen remodel or fitting starts out with great kitchen floor plans. Edraw helps you easily create kitchen elevations to get your dream kitchen. Kitchen Elevation, is a non-perspective drawing of a kitchen from the front, rear, or side that indicates how the planned or existing structure is situated. It shows the layout of the kitchen gadgets and kitchen furniture, which is helpful for checking kitchen gadgets and performing startups and shutdowns. Five crucial steps to a great kitchen design! 1. Get the light right and this will ensure that you and your family will benefit from much of this illumination when dining. 2. Connect with the dining space. Dining space is an ideal place for the activities to spill over into these areas. 3. Connect the Sun Room. When the kitchen connects the Sun room, it allows for great light in the evening when you come back home form work. 4. Place a window at the sink location. It is made much more bearable when you have access to a pleasant view of the outside. 5. Choose gas or electric. Generally, you need both, because gas allows for greater control while an electric oven greatly saves your time. How to Create a Kitchen Elevation? In Edraw, the Kitchen Elevation Template helps you easily create kitchen elevations using many built-in symbols. Double click the template from Floor Plans Category on the starting page to enter the drawing page. You will discover abundant symbols and easy-to-use tools available for kitchen elevations. Edraw includes lots of kitchen elevation symbols created to meet users' different drawing requirements. 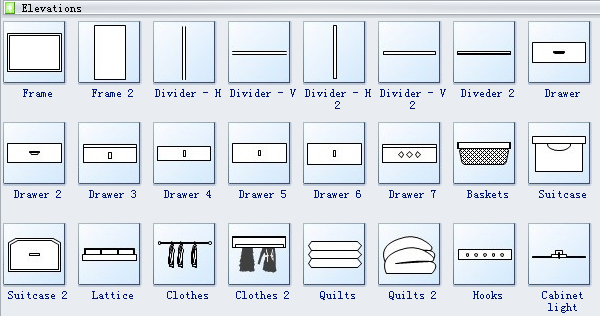 In Edraw library, you can easily use kitchen elevation symbols to depict frame, divider, drawer, basket, suitcase, lattice, etc. 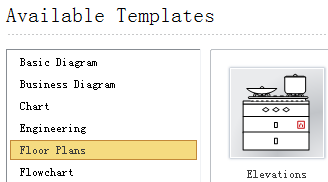 Go to Elevation Diagram Symbols page to have a general knowledge about the symbols. 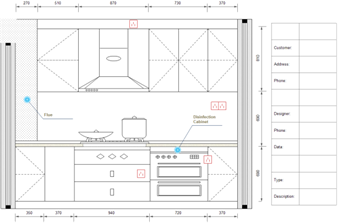 Check out kitchen layout tool or kitchen floor planner here. Download free printable kitchen layout templates here. 1. On the File menu, point to New, point to Floor Plans, and double click Kitchen Elevation template. A new drawing page will open. 2. Go to the library pane on the left of the canvas. From Elevations, drag elevation shapes you need.